A professional cyclist from an all-diabetes riding team joined Ride Leicester’s Castle Classic & Let’s Ride Leicester event. Sam Brand is a member of Team Novo Nordisk (TNN) and was asked to join the starting line-up for Let’s Ride Leicester family bike ride which took place on Sunday, August 12. 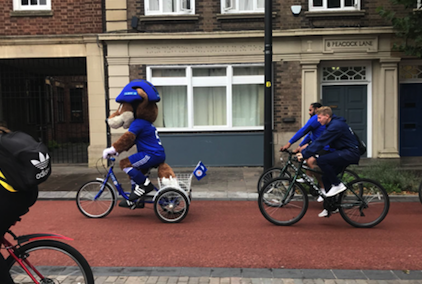 The 27-year-old, who was diagnosed with type 1 diabetes aged 10, was asked to participate in the annual celebration of cycling and people-friendly streets by the Leicester Changing Diabetes programme to inspire, educate, and empower everyone affected by diabetes. Sam said: “I’m hugely honoured to be asked to ride the route across Leicester. Cycling and diabetes are both huge parts of my life, so being asked to take part in an event involving my passion and raising awareness of my condition made total sense. Sam was joined by Team Novo Nordisk ambassador Brais Dacal who was on hand to speak to children and young people with questions about diabetes, discuss how the professional riding team have overcome obstacles relating to their condition and provide tips on living a healthy life. Roads along the 6.5km route around Leicester were traffic free and ‘open for people’ during the cycling event, which has been described as a “street festival for anyone on a bike”, by organisers British Cycling and Leicester City Council. Team Novo Nordisk was founded in December 2012 when Phil Southerland, co-founder and CEO of Team Novo Nordisk, partnered with Danish pharmeutical company Novo Nordisk to create Team Novo Nordisk based on a shared goal to inspire, educate and empower people around the world affected by diabetes. Since then, the team has gone from strength to strength, competing in major professional races around the world. In addition to the men’s professional team, Team Novo Nordisk includes a development team, junior team and professional female track star, Mandy Marquardt. In October, Leicester became the first UK city to join the global partnership programme and only the thirdEuropean city alongside Rome and Copenhagen. By working together, it is hoped the participating cities will increase awareness and community engagement as part of a drive to reduce the burden of diabetes. During the festival, the Leicester Diabetes Centre hosted the HeART Zone outside Leicester Cathedral where families took part in a range of arts and crafts to explore health and wellness. The Leicester Diabetes Centre – a partnership and collaboration between the University Hospitals of Leicester NHS Trust and theUniversity of Leicester –is an international Centre of Excellence in diabetes research, education and innovation and is led by Professor Melanie Davies CBE and Professor Kamlesh Khunti. Professor Davies, Director of the Leicester Diabetes Centre and Professor of Diabetes Medicine at the University of Leicester, said: “Let’s Ride Leicester is encouraging people to participate in exercise outdoors and to think about cycling as a transport option. As part of the Leicester Changing Diabetes programme we are continually seeking new ways to introduce healthier lifestyles to people in a bid to drive down type 2 diabetes numbers, as we already know the condition is associated with poor diet and lack of activity.